In the wake of school shootings and round-the-clock news coverage of deadly shootings some students are being prepared in ways their parents never were: bulletproof backpacks. Companies that sell products that offer increased protection from gunfire have announced an uptick in sales. That includes Bulletsafe, a Troy, Mich.-based company that sells a $99 panel that inserts into any backpack for added protection. “I think it’s main use is for people to sleep better at night,” said Tom Nardone, when asked about the usefulness of the product. Nardone’s product is marketed as a bulletproof backpack panel capable of stopping all handgun rounds up to a .44 magnum. It’s the size of a notebook and fits into most backpacks, but he’s the first to admit that the likelihood that your child is near your backpack at the exact moment a shooting happens is slim. Still, parents are buying them with hopes that it’s an added layer of protection in that worst-case scenario. 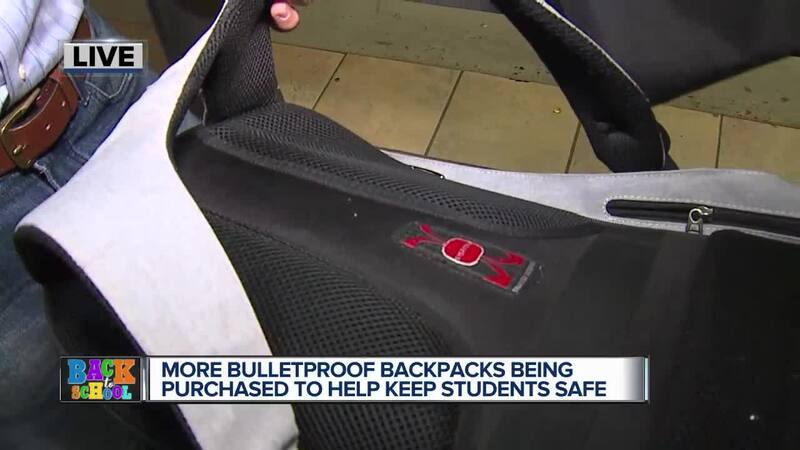 7 Action News took a backpack with the Bulletsafe backpack panel inside it — true to its promotion, it stopped rounds from both a 9mm and a .45 magnum. We attempted a higher-powered rifle outside of the specs that the panel is graded to stop, and unsurprisingly the bullet penetrated the panel. While the thought of a school shooting may seem unrealistic to some, the reality is that Michigan holds the unwanted distinction as the #1 school on the “State of Concern” report released this week by the Educator’s School Safety Network. 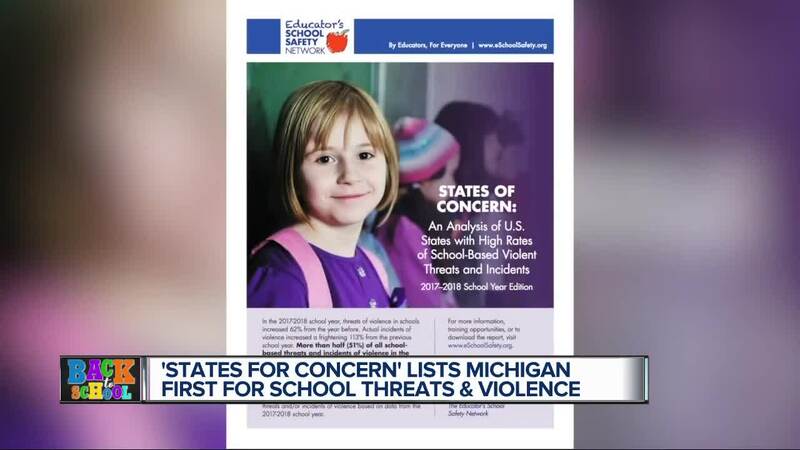 The report described that during the 2017-2018 school year more than half of all school-based threats and incidents of violence occurred in 10 states, Michigan tops the list because of a gigantic spike in school threats. The problem became more visible after the Parkland, Florida school shooting — the state attorney held a press conference last April after false threats spiked. In Macomb County the Prosecuting Attorney’s Office began working on a total of 72 cases, between that shooting and the end of the school year. A total of 60 juveniles and 12 young adults are being charged with felonies as a result of the threats. Amanda Klinger, the director of operations for the Educator’s School Safety Network, told 7 Action News that more needs to be done. While the data doesn’t explain why it’s happening, it does shine a light on the discussion. Klinger said she hopes that it starts a conversation that goes beyond adding security measures to schools, but training people to see warning signs of violence.